Gorillas are the largest of the primate family. They inhabit the tropical and subtropical rainforests of central africa. Perhaps their most well known adaptation is their opposable thumbs on both their hands and feet. Unlike other animals, this gives them the ability to grasp things in one hand. Their fur serves three purposes; Keeps them warm, camouflages them in the rainforest, and it also protects them from insects like mosquitoes because of its thickness. Another adaptation is their stocky build and elongated arms. This shows that they once may have been a tree dwelling primate, but have since adapted to life on the forest floor. There are many different species of the poison dart frog. All of them have a vibrant skin colour that acts as a warning to predators. This warning is of their toxicity. Poison dart frogs are covered in a toxin that is believed to be derived from plants. Scientists believe this based on the poison dart frog’s diet and the fact that when they are bred in captivity, the captive frogs never become toxic. The toxin is released from glands in their skin. This toxic substance means that the poison dart frog is not susceptible to many predators. In fact, the only known predator of the poison dart frog is Leimadophis epinephelus (could not find a common name). This snake is not immune but rather, tolerant of the toxin. Bengal tigers have a few unique adaptations that make them suitable predators in tropical rainforests. One of them is their dark fur coat and black stripes. 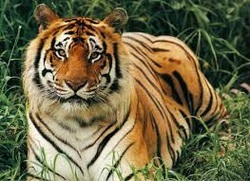 Bengal tigers have a darker coat than other tigers. This serves as a sort of camouflage because the dark coat and stripes combine with the shade of the trees to blend in with the forest floor. Added to the factor of camouflage is their soft pads on the bottom of their feet. These pads allow the bengal tiger to move both quickly and stealthily while sneaking up on prey. They also have retractable claws. This gives the bengal tiger yet another weapon to overtake their prey. An inherited trait or adaptation from saber toothed tigers is nocturnal vision. This allows the bengal tiger to hunt in both day and night. All of these factors make the bengal tiger one of the top predators in the tropical rainforest. 3 toed sloths are adapted to live in the canopy of the rainforest. They are a very slow moving creature but this does benefit them because it makes it harder for predators to see them. Infact, they move so slow that algae grows on the outside of their fur, assisting them in camouflaging with the trees. High up in trees, sloths hang upside down by their long claws. They spend almost their entire lives in trees, sleeping from anywhere between 15 - 20 hours a day. Sloths live and sleep in trees because they are virtually defenceless on the ground. 3 toed sloths also have another unique adaptation, an extra neck vertebrae which allows them to turn their head nearly 270 degrees. This allows sloths to turn and look down at the forest floor while hanging from a tree. Piranhas have many adaptations that allow them to be successful in the rainforest. Perhaps the most interesting and important adaptation of Piranhas is that they live and hunt in schools. The reason that Piranhas hunt in schools is because the pack holds a much greater attacking force than a single Piranha does. Hunting in schools means that Piranhas broaden their diet. Instead of feeding on amphibians, fruits, seeds, and other native fish, they can also successfully attack larger animals like cattle, young herons, and caimans (small crocodilians). Their successful attacks on large prey cannot be attributed to just the fact that they hunt in schools, but also, their famous razor sharp teeth. Piranhas have triangle shaped teeth on both their upper and lower jaw. These teeth fit perfectly into the spaces on the opposite jaw creating a very powerful bite that can tear flesh from bone. Piranhas also have a good sense of smell. In the sometimes murky waters of the rainforest, this is very important because they cannot always rely on their vision to find food, instead they must use their sense of smell.